Oclee and I were planning to use this weekend to make a film of the nurse training demonstration that we have been working on for the last six months. As you will appreciate, it is pretty difficult to waltz into offices in institutions and companies and demonstrate Second Life. Even if you try to make contact with the potential client's IT bods in advance, there are generally issues with firewalls and connectivity which are hard to overcome for an hour's meeting. I'd tried bringing a dongle and using external connections, but that really isn't much better, and depends upon what sort of signal you can achieve in the location. Thus I found myself at one demonstration, turned to grey plasticine and apparently naked. So, we thought that a practical solution to these problems was to make a film, which shows everything the demonstration can show, but in a stable environment on a good connection. Logging into Second Life on Saturday, the first thing we discovered was that the HUD (heads-up display, something which presents like a window on the screen, within SL, see above) we have made wasn't working in the expected way. It's been a while since we did the last demonstration, and there's been an update since then. And they broke shared media on a HUD. 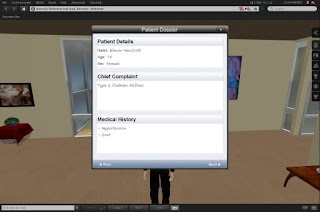 Our HUD links to a database which serves the images up, and the avatar making clicks in world. If shared media for HUDs is broken, so is our HUD. Initially I was sceptical that LL could possibly have put out a viewer which breaks their much-trumpeted shiny shared media whatsit, but they did. They knew during the beta testing that it was going to break HUDs using shared media and they did it big fat anyway. We searched the JIRA, found a lot of people complaining about the same thing. Added our comments and votes to the issue and then spent the weekend on other things. I have now found that Snowglobe, the open source viewer, is working for shared media on HUDs, although I am tending to crash frequently with any of the v2 viewers. I am going to have to try to spend some time finding out what's going on. One tip which Oclee passed on to me, was that the preferences revert back and don't tend to "stick" for some things, especially if you switch viewers, and so it is worth checking whether you have "enable openGL vertex buffer objects" checked. (In v2 you'll find your preferences under the Me menu, and that setting is on the Graphics tab and then the Hardware button.) If you have had problems with v2, you might try unchecking that option and seeing whether that makes a difference. I'm still struggling with a lot of the changes in the v2 viewer, not least the fact that so many things I use all the time have been seemingly buried. I'll have to see how I get on with Snowglobe. It's very annoying though, that it is broken in the main viewer, and makes it difficult to persuade very conservative institutions and companies that SL is a stable platform for development, when something that was working perfectly well a couple of weeks ago is no longer working. Coupled with the high cost of development in SL, it may well be a deal breaker. OpenSim looks ever more attractive. ...Kirsten's Viewer "Kirstens S20(35)" which was released on August 30, 2010, and based on SL Viewer v2.1.0, actually FIXED these two issues (i.e no sound in videos playing in HUD, and no interactivity in webpages embedded as a HUD)." Yes - but initially I was crashing every time I logged in with Kirsten's, which didn't make it a whole lot more usable. Then I found snowglobe was working for me, and that was the case for well over a week, when I suddenly started crashing more or less on entry to SL. When I tried Kirsten's again, I was fine on that, so they seem to have switched places. I have *no* idea why they changed over - it happened in the course of one morning... Snowglobe worked fine for the first two or three hours, and then just kept on crashing me.